We recently introduced you to a new feature in TypePad, the ability to create individual Pages in your weblog. As we mentioned, this is a great way to add new information to your weblog but how else can this great feature be used? The Pages feature is also a great way to build a custom website for a business or for any purpose at all. Let's say that you want to build a website for your business. With the introduction of a new preference, you can now create a series of Pages to build your website instead of using posts. This allows you to control the Page’s file name and it is positioned in the main directory of your website’s folder. For example, you can create an about page, a contact page, a page to display products or services, displaying a map with directions to your location or even sharing your own customer feedback. The possibilities are endless. Start by creating a new weblog and click on the Compose tab to begin creating the various Pages that will be the content for your website. You can use our text editor's tools to add as much content as you would like to your Pages. Once you have finished, go to Weblogs > Configure > Preferences and select a Page from the drop down menu under "Front Page Preferences." There you can select the Page that will be displayed when users visit your website's URL. When you enable a list of Pages on your website from Weblogs > Design > Select Content, you have yourself a website complete with navigation. Also, if you choose to combine your weblog and website in one, you can display a links to your recent posts on your sidebar from Weblogs > Design > Select Content. As a finishing touch, you can use domain mapping for a custom URL. No one will ever have to know that building your website was so easy to do! This Friday evening, June 29th, starting at 11:59 pm PST (that's 06:49 am UTC on June 30th), we'll be taking TypePad offline for approximately two hours to perform routine maintenance. During this time, the TypePad service, all TypePad blogs and the TypeKey authentication service will be unavailable. We've added the ability for you to add "Save to del.icio.us" and "Digg This" links to the footers of your posts and pages. These links will let your readers easily share your posts and pages on the popular social content sharing services del.icio.us and Digg. While we did this, we updated the design of the page that lets you select the content that appears in post and page footers to make it easier to control the footer content that appears on your site. We're looking to add more social sharing services in the future, so let us know which services your readers are using. Based on popular request, we've also added the ability for you to let your readers leave comments and TrackBacks on pages. This is a great feature for those of you who use pages to add content that doesn't quite fit in the time-based flow of your blog, but that you'd like to collect feedback on. You can turn comments and TrackBacks on or off by default for new pages you create, and control them per-page just as you can with posts. Starting today, the URLs TypePad generates for your posts will use hyphens ( - ) instead of underscores ( _ ) to replace any whitespace or special characters in your post title. This change makes it more likely that a search engine will index the words in a post's URL. It's All About the About Page! While we've mentioned before how to share information on your About Page, we thought that we'd like to offer even more things that you can do with this feature. 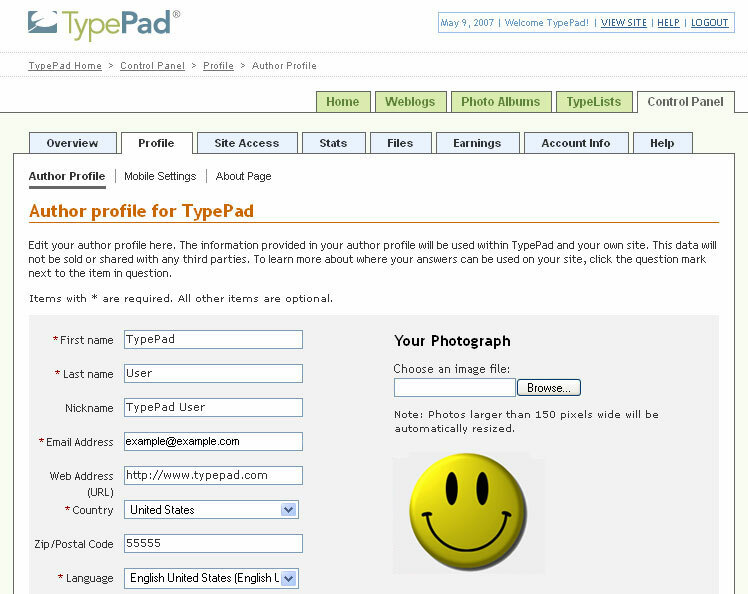 All TypePad weblogs come with an About Page that is an ideal place share any information that you would like your readers to know about you. This can be trivial information like your favorite color or more vital information like you what you do for a living or your hobbies. By having a page like this, your readers are able to get an idea about who you are and why you blog. Your About Page is created from the information found in your Author Profile, so you would need to complete whatever information you would like to be added to this page. The spaces for Your Interests, Your Extended Biography, and Your One-Line Biography in particular are excellent sections to use to give a detailed picture of yourself. After adding the information that you would like to your About Page, you can then customize your About Page by choosing the design you would like to use and selecting which content to display on your site. This content can also include TypeLists, which is an additional way to share even more information about yourself. In addition, if you use domain mapping, you can map your About Page so that it uses your domain URL as well. 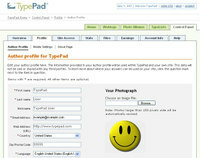 Instead of using the default About Page that comes with your account, you can also use the TypePad Pages feature to create an About Page that uses the same design as your weblog or - if you are a Pro or Premium subscriber with guest authors - you can use TypePad Pages to make a new About Page for each author. 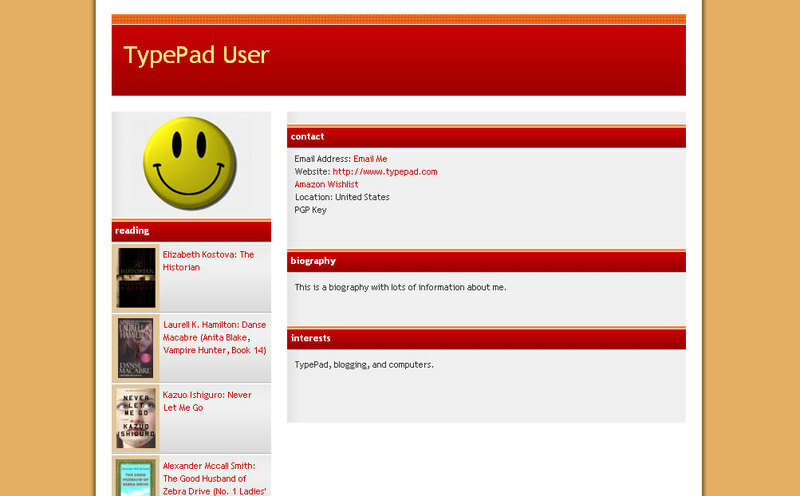 Also, by using a TypePad Page, you are able to make your weblog and your About Page use the exact same design. TypePad is a Webware 100 winner! Oh...oops...wrong acceptance speech. Who we’d really like to thank is you! We just got the great news that TypePad has been named a Webware 100 winner in the Publishing category – thanks to your votes! 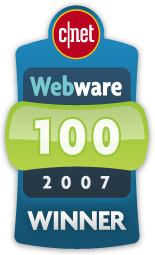 The Webware 100 awards recognize the best Web 2.0 apps. From an initial list of 5,000 nominations, 250 were selected as finalists by the editors of Webware.com, a CNET site. The final list of 10 winners in each of 10 categories was determined by almost half a million votes from users like you. We’d also like to congratulate our sister product Vox, which was also named one of the Web’s 10 best publishing services. 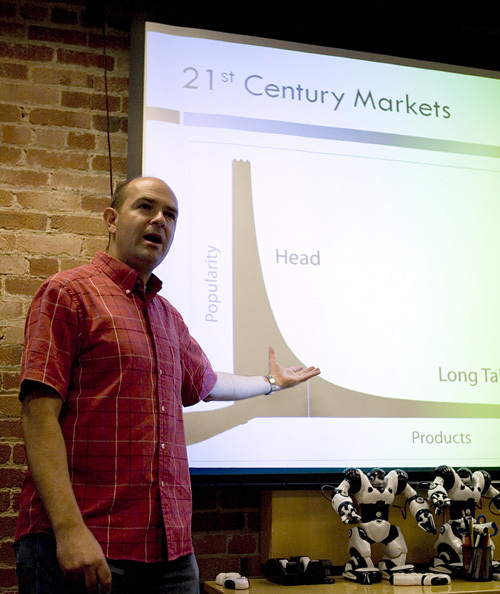 Last summer when The Long Tail was released, we did a podcast interview with Chris, which if you missed it then is still worth a listen. Many thanks to Chris for stopping in this morning! A friendly reminder from Team TypePad that voting for the Webware 100 Awards is coming to a close. If you haven't already voted, and want to show your TypePad love, be sure to vote for TypePad in the Publishing category! Our thanks to everyone who's voted! We know that you want a web presence, but you also want to protect yourself and your online assets. Perhaps you want to blog anonymously or the photos you post on your blog are the way you make a living. There are many ways that you can safeguard your content and yourself. The author information for the weblog and your posts is pulled from the Author Profile. If you do not have any entry in the Nickname field, the content of the First Name and Last Name fields will be used as the Author name for the post and may show up in Google searches or in your feeds. If you have images that you want to display on your weblog, but would like to protect, you may wish to look into digital watermarks, which provide some protection and a way to deter others from using your images. There is a very good article on digital watermarking at Wikipedia. If you want to keep your content private, you can choose to password protect your entire account, or just specific blogs or Photo Albums. 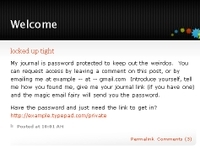 Then, only users with the username and password will be able to access your protected content. 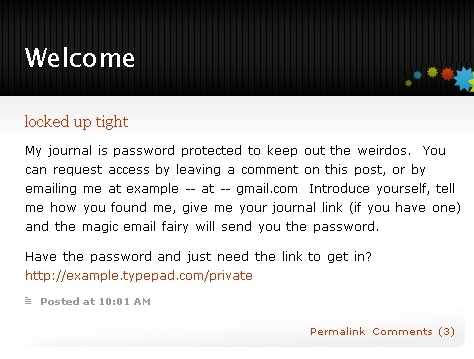 If you are a subscriber with a Plus, Pro, or Premium account - which allow for multiple weblogs - you could create a public weblog that serves as an introduction to your password protected weblog. You could include introduction text, a way to contact you, and a link to the password protected weblog and keep it visible on that weblog using a Featured Post or a Page. You could then set this weblog as the Home weblog in your account so that your readers are able to access it via the shorter URL for your account - http://example.typepad.com/. If you want your weblog to be public, but you don't want to show up in search engines at all, you can change your weblog's Publicity settings at Weblogs > Configure > Publicity. Set "Publicize this Weblog" to No to block search engines from indexing your blog. Many of you have asked for the ability to layout your blog content with two sidebars side-by-side. Our template guru has been hard at work adding this new option, and making sure it looks great with all of your designs, so we’re very happy to let you know that it’s now available. You can select it by going to Design > Layout. Another feature we heard you ask for is more information about who’s visited your site. The new statistics page is a great example of the old a-picture-is-worth-a-thousand-words adage so we’ll let this screenshot (mostly) speak for itself. (So many ways to view your data!) We do want to be sure to point out the new “Download page view records” link in the top right corner. Clicking this link will give you – in a format that can be easily opened in most spreadsheet programs – page view data for the life of your blog.